For the second year in a row, I banged out a complete 24-page story from scratch for 24-Hour Comics Day. 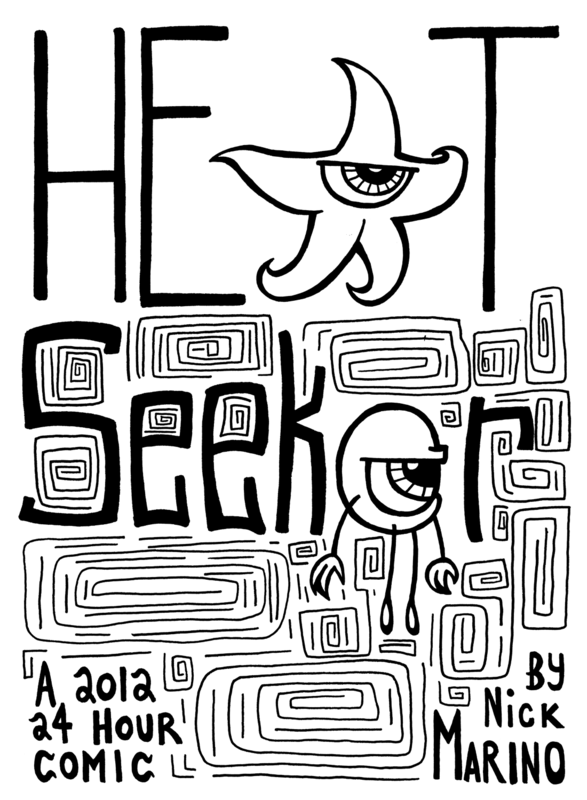 The result is Heat Seeker, an experimental fantasy tale about a mysterious eyeball's journey from cold to warmth. I'm trying out Issuu for the first time and I'd love to hear your feedback on the reading experience. I hope you enjoy Heat Seeker. I had a kickass time writing and drawing it, and I want that fun to spill through as you breeze through this weird comic book! UPDATE: If you hate reading stuff online, you can download a PDF of Heat Seeker. UPDATE 2: You can also read Heat Seeker on Flickr and deviantART. hey Nick. I liked the patterns and line shapes in the back grounds of the scenes. The web layout for reading it was superb. The story seems to be an intro to yet another one of your infinite sagas. Thx for the feedback, Thom!! I don't have any plans to make it an ongoing thing, but I'm stoked that you felt like there was potential for more. I was scared that Issuu would be hard to read, especially with how small it is embedded on the site. But you had the forethought to make the words big enough to read, which I always appreciate. I think Issuu is also cool because you can easily fullscreen it, which is how I like to use it. I wish I could take credit for being smart enough to letter large, but the truth is that I just have a hard time writing small so it's natural for me to letter large. Thanks for reading and commenting!! !